I have a friend who made lovely cuff links in the form of spiral tubing (think a big spring) using just his hands. He used thin-walled sterling tubing and bent it with his fingers, taking his time to make a perfect, unkinked spiral that measured about ¾ inch in diameter. He then set gems in the ends of the tube. Bending a long piece of tubing with your hands is much easier than bending a short piece. For example, a piece of tubing that measures about 8 inches long provides so much leverage that when the ends of the tube are held and carefully bent, the center will often bend well and smoothly. However, this involves so much waste that it’s not always an option. Instead, you can temporarily solder rods or non-precious tubes to the ends of short pieces of precious tube to bend it, and then remove the extra pieces. Filling a tube with support material can help you to bend it effectively. 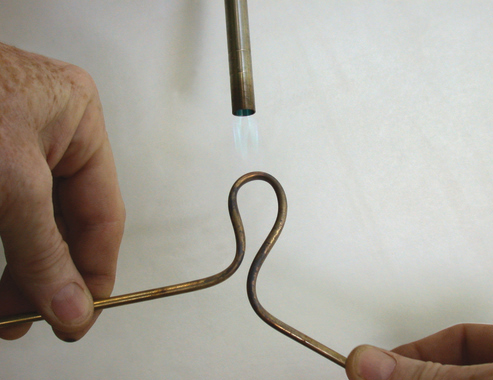 You can pour a low-melting-temperature metal inside the tube before bending it and later melt it out. (I use metals from Small Parts Inc., smallparts.com, which melt in hot water.) You can also try using wax or freezing water inside a tube to make ice, but I find that they do not work as well for support materials as metal. For larger sizes of tubing, you can roll red European pitch into “snakes” that harden and can be fed into a tube and warmed to fill it. In addition, you can pack the tube with a stiff, fine powder such as sand, sugar, or Plaster of Paris, cork the ends, and bend it. 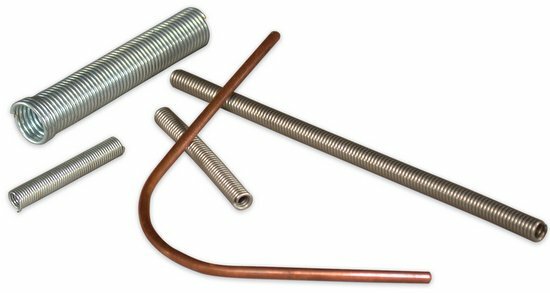 For tubing with a diameter larger than 1/8 inch, you can use small versions of plumbers’ tube-bending jigs, but you may notice a bit of flattening in the bent area. You can find these jigs in automotive and hobby stores. Tightly wound springs work well for any diameter of tube when slipped over it for bending. This method is very effective, particularly if you can get a stiff steel spring into which the tube fits tightly. David Cruickshank of Sydney, Australia, uses a very interesting method for curving tubing to make hollow earrings. He uses a steel rod with a curl on the end and a drawplate to curl tube tightly, making precise jump rings. To see the trick explained step-by-step, http://davidcruickshank.ganoksin.com/blogs/.